I opened the fridge to put something in one day and was confronted by a space packed full of food with nowhere to add anything else. Or so I thought at first. Then I realized that it was only the front half of the space that was full and there was almost nothing in the back. I moved the containers around a bit and freed up plenty of room for whatever it was I was trying to put away. 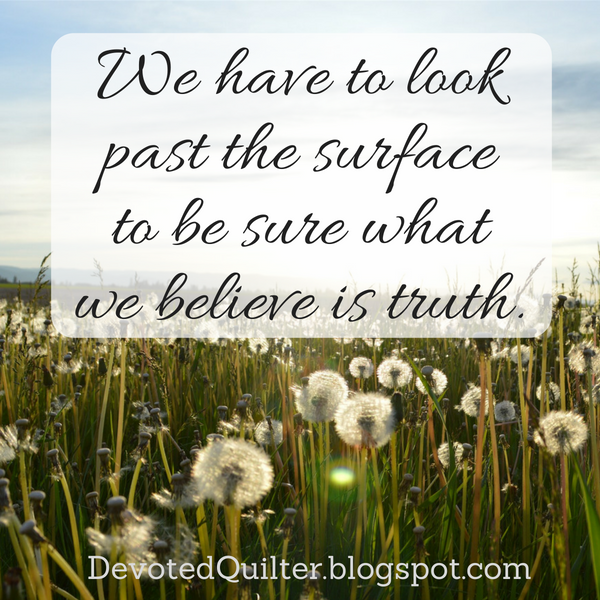 There are times when things on the surface conceal what is really going on. Not only in the fridge, of course, but in all areas of life. For example, have you heard the phrase 'skinny fat'? It refers to people who are slim, but whose lifestyle and eating habits are unhealthy, resulting in them having almost the same health risks as a person who is overweight. And with the news recently of the suicides of Kate Spade and Anthony Bourdain, I have to acknowledge that mental illness is often hidden. We may not know what is going on in the lives of others, maybe even people we think we know well. People suffering from depression may be able to carry out their normal activities so it looks from the outside like everything is fine, when in reality it is not. The stigma that prevents people from talking about mental illness is a dangerous thing. Jesus talked about a time when His followers need to be careful to look past the surface: "Beware of false prophets who come disguised as harmless sheep but are really vicious wolves" (Matthew 7:15). When faced with a new pastor or teacher or writer we need to look carefully at what they say. Does what they teach line up with Scripture? If not, then we need to reject their teaching as harmful, as something that could pull us away from God and His will for us. We need to be especially careful when what they say appeals to us. Paul said to Timothy, "For a time is coming when people will no longer listen to sound and wholesome teaching. They will follow their own desires and will look for teachers who will tell them whatever their itching ears want to hear" (2 Timothy 4:3). I think of those who teach the 'prosperity gospel' whenever I read this verse. If ever a message appeals to 'itching ears', this would be it. Prosperity gospel claims that as Christians we can have everything we want - money, happiness, health, you name it. But that's not what the Bible teaches. Jesus Himself said, "I have told you all this so that you may have peace in me. Here on earth you will have many trials and sorrows. But take heart, because I have overcome the world" (John 16:33). That doesn't mean that the Christian life is nothing but misery, but it does mean we won't get everything we want just by praying for it. Not everything we want is what God has planned for us. This is not to say that every message that appeals to us is wrong! If the message lines up with what we read in the Bible, then we can embrace it wholeheartedly. The message of salvation through faith, not through the work I've done, for example, is a wonderful message that is supported by Scripture. "God saved you by his grace when you believed. And you can’t take credit for this; it is a gift from God. Salvation is not a reward for the good things we have done, so none of us can boast about it. For we are God’s masterpiece. He has created us anew in Christ Jesus, so we can do the good things he planned for us long ago" (Ephesians 2:8-10). Whatever the source and whatever the message, we have to look past the attractive surface and dig deeper, making sure that what we believe is actually the truth. A friend lost a son two months ago to suicide. No one saw it coming, but the signs were there. Prayers for all who suffer mental illness. Prayers for eyes to see beyond the surface.